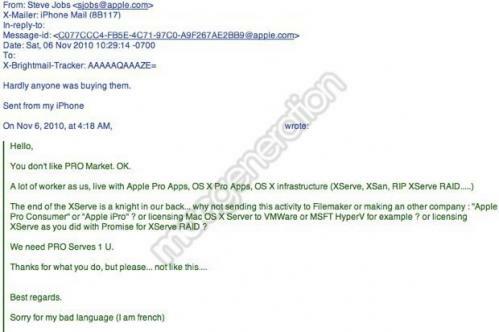 French site MacGeneration reports [Google translation] that one of its readers emailed Apple CEO Steve Jobs to inquire about the reasons behind last Friday's announcement that the company will discontinue the Xserve rackmount server. Jobs reportedly responded to the email, unsurprisingly noting that poor sales were the reason for the discontinuation. Hardly anyone was buying them. While Apple has not routinely revealed sales figures for the Xserve, the report points to data from research firm Gartner published several years ago showing that Apple was selling on the order of 10,000 units per quarter, a tiny fraction of the company's overall computer sales. With the discontinuation of the Xserve, Apple has suggested that potential customers consider either the Mac mini, which gained a server option in late 2009, or the Mac Pro, which saw Apple release a server-specific standard configuration on Friday.